(11) The son of Vyâsadeva said: 'He, Lord Yamarâja, the controller of all living entities, thus being questioned replied his servants, pleased as he was to be reminded of the lotus feet of the Lord. (12) Yamarâja said: 'Superior to me there is another one, another Lord, who is as the warp and woof of cloth to all the mobile and immobile living beings. In Him the entire cosmos is found and of Him there are the partial aspects of the maintenance [Vishnu], creation [Brahmâ] and destruction [S'iva] of this universe. The entire creation is controlled by Him like a bull is by a rope through its nose. (13) The way one ties oxen to a rope, He ties the people with different basic denominations and duties [of varna and âs'rama] to His word [the Vedic knowledge], according to which they scrupulously carry their offerings to Him. (31) [S'rî S'uka said:] 'Therefore, oh descendant of Kuru, understand that the glorification of Lord Vishnu [in particular singing His name in congregation; sankîrtana] is the ultimate form of atonement, the best that one can do in the world to deal with one's sins, however great they are. (32) The hearts of those who always listen to and sing about the heroism of the Lord that wipes away all sin, are by their devotional service, their bhakti, very easily purified, while such a thing is not as easily brought about when one is [merely] of vows and rituals. (33) He who holds on to the honey of Krishna's lotus feet, will not again desire to enjoy the illusory quality of nature [mâyâ] that brings distress. Anyone else however, who enchanted by lust tries to do something to cleanse the passion out of his soul, will surely find the passion reappear. Third revised edition, loaded August 23, 2018. 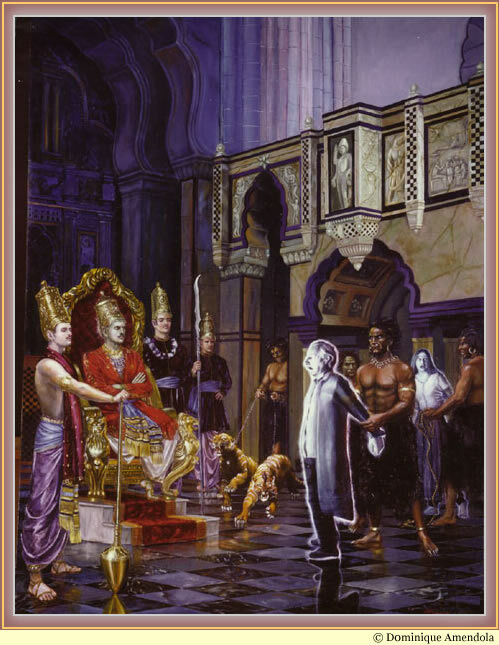 The king said: 'What was the reply of the god, the King of Dharma, Yamarâja, after he had heard what his servants had to say about the obstruction of his order when they were defeated by the servants of the Slayer of Mura [Krishna], He who rules all people of the world? S'rî S'uka said: 'The servants of death, oh King, whose plans had been frustrated by the men of the Supreme Lord, informed their master Yamarâja, the ruler of the city of Samyamanî [as follows]. The Yamadûtas said: 'How many controllers are there factually in this material world, oh master, who are the ones responsible for the consequences of performing the three kinds of activities [karma, akarma and vikarma or profit, non-profit and criminal, see B.G. 4: 17]? Given the many authorities in this world to chastise the sinner or not, for whom would there be [the bitterness of] death [when one is brought before you] and for whom [the nectar of] immortality [of Vaikunthha]? Considering the diversity of rulers over the many karmîs [profit-minded persons] in this world, should there not be one central administrative rule, like one has with the different heads of state departments? In that sense you would be the one supreme master and ruler over all beings, including the other controllers; you would be the master of punishment to tell right from wrong in human society. But in this world none of that can be found, now your order, the punishment you ordained, has been contested by four of the most magnificent and perfect beings. They forcibly cut the ropes and released this sinner who by us according to your order was taken to the places of requital. The son of Vyâsadeva said: 'He, Lord Yamarâja, the controller of all living entities, thus being questioned replied his servants, pleased as he was to be reminded of the lotus feet of the Lord. Yamarâja said: 'Superior to me there is another one, another Lord, who is as the warp and woof of cloth to all the mobile and immobile living beings. In Him the entire cosmos is found and of Him there are the partial aspects of the maintenance [Vishnu], creation [Brahmâ] and destruction [S'iva] of this universe. The entire creation is controlled by Him like a bull is by a rope through its nose. The way one ties oxen to a rope, He ties the people with different basic denominations and duties [of varna and âs'rama] to His word [the Vedic knowledge], according to which they scrupulously carry their offerings to Him. I myself, the Lord of death, Indra the king of heaven, Nirriti of chaos, Varuna of water, Candra of the moon, Agni of fire, S'iva of destruction, Pavana of the air, Brahmâ of creation, Sûrya of the sun, Vis'vâsu of beauty [see 4.18: 17], the eight Vasus of goodness, the Sâdhyas of cultivation, the Maruts of the wind, the Rudras of anger, the Siddhas of perfection and the other souls creating order in the universe, as also immortal rulers like Brihaspati and sages like Bhrigu, have, despite being ruled by goodness and being free from [the lower qualities of] passion and ignorance, under the influence of His mâyâ no knowledge of His motives. And how much more would that not apply to others besides them? He, the Supersoul present in the heart of all living beings, can factually not be seen or known through the senses, the mind, the breath or by means of ideation and words, just like the different parts of the body cannot see the eyes watching over them [compare B.G. 7: 26]. The attractive servants of the independent, transcendental Lord ruling everything, the Master of Mâyâ, the Great Soul, generally move around in this world with His physical qualities and nature. Vishnu's servants, the Vishnudûtas, who are worshiped by the enlightened souls, have forms rarely seen that are most wonderful to behold. They protect the mortals devoted to the Lord from enemies and from my men, so that they are protected from practically every side. The great rishis, the gods, the best of perfection and the demons, the humans, as also the souls founded in knowledge [the Vidhyâdharas] and the celestial singers [the Câranas] and such, have no knowledge of the [full of] dharma that is enacted by the Supreme Lord in person. Lord Brahmâ, Nârada, Lord S'iva, the four Kumâras, Kapila, Manu, Prahlâda, Janaka, Bhîshma, Bali, the son of Vyâsa [S'uka] and I myself [Yamarâja]; we, these twelve [mahâjanas], have knowledge of the bhâgavata-dharma [the emancipation in surrender to the Supreme Lord] my dear servants, that is most confidential, transcendental and hard to grasp. He who understands it achieves eternal life [compare 3.32: 2 and B.G. 18: 66]. We all recognize that for the people living in this material world the yoga of devotion unto the Supreme Lord beginning with the singing of the holy name, constitutes the supreme dharma. Just consider, my sons, how by pronouncing the holy name of the Lord, even Ajâmila was delivered from the noose of death. Even this sinner Ajâmila attained liberation when he, at the moment of his death, innocently with 'Nârâyana' called for his son. This much of the congregational singing of the qualities of His names and deeds is enough [as proof of goodwill] to remove the sins of man. Great personalities practically always do not know this [truth, this lead], for their minds got bewildered by mâyâ, the illusory energy of the goddess, and because their intelligence to a great extend was dulled by the burden of the fruitful activities and the sweetness of the flowery language of sacrificing as prescribed [in the three Vedas, see also B.G. 2: 42-43]. Knowing this, sharp-minded souls with all their heart take to the yoga of loving the Supreme and Unlimited Lord. Such persons therefore do not deserve my punishment. And if there would be any fall down of them, that also will be destroyed by the high praise they voice. They, the devotees, who with an equal vision are of surrender to the Supreme Lord and whose sacred histories are proclaimed by the demigods and perfected souls, you should never approach, for they are fully protected by the mace of the Lord. It is not to us to punish them, just as it is not given to time itself [to tell right from wrong]. Communities of transcendental swanlike souls, who free from material attachment are of self-realization, continuously relish the honey of the lotus feet. [But] they who enjoy a household life in desires of attachment, are on the path that leads to hell. Bring those before me who in their falsehood turned against Mukunda, the Lord of Liberation [compare 2.1: 4]. They who run from the truth and fail in their duties unto Lord Vishnu, they whose tongues never express the names and qualities of the Supreme Lord, who do not carry Him in their heart or remember His lotus feet and not even once bowed their heads to Krishna [in a temple e.g., see B.G. 4: 4-6], bring them all before me. [S'rî S'uka said:] 'Therefore, oh descendant of Kuru, understand that the glorification of Lord Vishnu [in particular singing His name in congregation; sankîrtana] is the ultimate form of atonement, the best that one can do in the world to deal with one's sins, however great they are. The hearts of those who always listen to and sing about the heroism of the Lord that wipes away all sin, are by their devotional service, their bhakti, very easily purified, while such a thing is not as easily brought about when one is [merely] of vows and rituals. He who holds on to the honey of Krishna's lotus feet, will not again desire to enjoy the illusory quality of nature [mâyâ] that brings distress. Anyone else however, who enchanted by lust tries to do something to cleanse the passion out of his soul, will surely find the passion reappear. The servants of Yamarâja by the words of their master being reminded of the greatness of the Lord, thus all stood perplexed. From then on, oh King, they feared to see the person, the devotee, who is fearless because of taking shelter of the Infallible One. The painting titled: 'The Court of Yamârâja' is © of D0minique Amendola. Used with permission. For more spiritual art of her making, visit dominiqueamendola.com.